Consider this the second big stakes night of probably 30 we’ll encounter over the course of this harness racing season. Sun Stakes Saturday gathers the best of each division to see which horse I fastest before they are onto the next set of stakes at the Meadowlands next week. We observed an enthralling evening of eliminations last week, watching 8-5 second choices win instead of 7-5 favorites — an act of rebellion akin to a vegan sniffing cheese. I am hoping, however, that Pocono Downs will have a more enticing menu on Saturday, July 1, because, frankly, I’m sick of tofu with salt. Some of these races have potential to provide flavorful payoffs; others, not so much. Those are the only two options really. 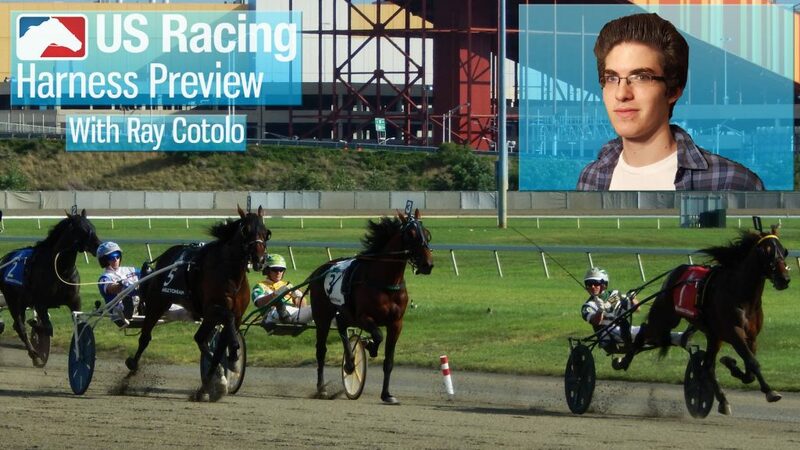 However, you will find a preview of the Earl Beal Jr. Memorial Consolation and Final over at Frank Cotolo’s Hambletonian Trail. Now break open that spice cabinet and let’s add some zest to these platters! We must deal with the losers — those that did not make the final — first. The $50,000 James Lynch consolation is itself a jigsaw puzzle that only includes corner pieces and no interior. Roaring To Go appears to be the main contender here, with her back class and what not, but her performance in the elimination does not warrant a whole lot of love and she appears just as vulnerable this time out. Improving into this race before putting in a mediocre mile in the elimination, Concerto could be in the best position to best the favorite. Looking back to her miles against conditioned stock at the Meadowlands, she seems able to capitalize when up against fields of weaker caliber, such as the one she’ll compete against here. As for the final, Agent Q is the filly deserving of favoritism, though Tequila Monday could claim that honor with her rail draw. Yet, after a dominant performance in the Fan Hanover, Bettors Up could again be ignored, with odds approaching value city — and I’m not talking money you could use to buy that living room set at Value City Furniture. We’re looking at possibly 5-1 odds on Bettors Up, which can only be described, hyperbolically, as a dream. If he doesn’t get face-slapped by dirt as he did in the elimination, Every Way Out should theoretically destroy this field. However, some theories are meant to be proven wrong — it’s what inspired the birds to fly. So why should we be relegated to the floor? Let’s shoot for the skies. All of this imagery would have made Air Strike such an appropriate outside contender, but we would be betting on him to bounce in a major way here. Though it’s possible he could have just been massively unlucky in his last few starts, which could justify you taking a shot on him at 50-1, I’d wait and see how he looks on the track first, because he did not look comfortable in the elimination. Given the season, Summer Side is actually the most appropriate outside contender. I guess, too, aside from it being summer time, you could argue he’s going to be involved on Saturday because he got locked-in last time and was unable to fully unleash himself around the final turn in the toughest elimination of the three. The final is another race for Fear The Dragon to lose, since he did kind of lose in the elimination last week — depending on how you look at it. Miso Fast jumped the North America Cup winner perfectly in the elimination, grabbing the lead and holding a margin that Fear The Dragon was incapable of overcoming. If somehow that scenario can set up again, Miso Fast may be worth a try to upset, but he will not be near the 11-1 that we should’ve jumped on last week. An interesting exotic contender here is Boogie Shuffle, who attempted to bottom out the field in his elimination, but faltered in the stretch to finish third. He has hit the board every start this season, including against some of the top names like Downbytheseaside, so he may try to be less aggressive here… or he could go full-sprint again, we’re not totally sure. It’s only appropriate that, in the Ben Franklin Memorial, we’d be looking for shockers. And these races could set up for one, too. That is, if we get the electric pace we’re expecting. These races gather horses that are lightning fast. Since God has somehow not struck me down for my humor and US Racing still has me on staff, let’s grab our past performances and use our bifocals to read between the lines. The consolation could serve as a rebound for Soto, who rose to fame and rode the pocket to that fame back during the George Morton Levy days. Launching to the lead uncharacteristically last week, he could be demonstrating that he’s live coming into this race or he was really hoping someone would give him a pocket trip. We’re assuming the former, because we want to be confident in our big price. The final is tricky because, quite frankly (pun not intended), we have no idea what’s going to happen. We’re just assuming the speedsters will “vroom, vroom” a little too much and something else will come sweeping in on the conveyor belt. Possibly Mach It So could fulfill this prophecy. He attempted to sweep by horses up the passing lane last week, but couldn’t. However, with a more intense pace ahead of him, maybe the front horses will tire just enough for him to reach Upset Island. All Bets Off appears to be in the best form in the race. Finishing second off a first-over trip in the elimination, he could pull off a similar stunt as he did in the Battle of Lake Erie when he rushed to the front moving to the final turn. This would only be possible with a blistering pace, however. Of course, he could also prove us wrong and win anyway! If I called it just the Cleveland Trotting Classic, it wouldn’t match the theme now would it? To make this short, sweet, succinct, and to the point, this race is really a matchup between Resolve and Obrigado. With Resolve likely to be the favorite to the inside, the obvious play is Obrigado, especially since he’s making his third start off a layoff and appears to be rounding back into his top form. Idyllic Beach (second, $2.10; $2.10) couldn’t slide up the passing lane to beat the favorite, Tequila Mondays. Gallic Sea (sixth, 21-1) broke down the backstretch on the final lap. Hail Damage Blues (fourth, 9/2) did not get the pocket; thus, she did not win (but neither did the pocket-rider). Air Strike (fifth, 59-1) got blasted in the face with dirt because of a breaker moving to the passing lane and managed to just finish the mile. Summer Side (fourth, 27-1) wasn’t let loose until the stretch when it was too late. Photobombr Hanover (sixth, 11-1) led for most of the way, but not at the finish. Shamballa (third, $2.40) managed to close his way into the final. Split The House scratched, so we’ll never know that we would’ve been totally right. Mach It So (third, $6.00) was overpowered by horses to his outside, as he passed tiring leaders. Wakizashi Hanover (sixth, 24-1) did what he was not supposed to do and pulled outside, faltering afterwards. Race-ial Profiling: How to Handicap Different Kinds of Races.